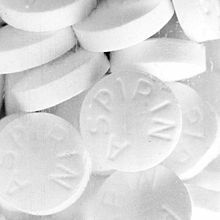 In English, the noun “drug” is thought to originate from Old French “drogue”, possibly deriving later into “droge-vate” from Middle Dutch meaning “dry barrels”, referring to medicinal plants preserved in them. The transitive verb “to drug” (meaning intentionally administer a substance to someone, often without their knowledge) arose later and invokes the psychoactive rather than medicinal properties of a substance. A medication or medicine is a drug taken to cure or ameliorate any symptoms of an illness or medical condition. The use may also be as preventive medicine that has future benefits but does not treat any existing or pre-existing diseases or symptoms. Dispensing of medication is often regulated by governments into three categories—over-the-counter medications, which are available in pharmacies and supermarkets without special restrictions; behind-the-counter medicines, which are dispensed by a pharmacist without needing a doctor’s prescription, and prescription only medicines, which must be prescribed by a licensed medical professional, usually a physician. Some shamans from different cultures use entheogens, defined as “generating the divine within” to achieve religious ecstasy. 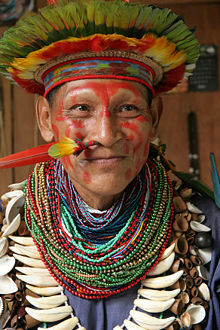 Amazonian shamans use ayahuasca (yagé) a hallucinogenic brew for this purpose. Mazatec shamans have a long and continuous tradition of religious use of Salvia divinorum a psychoactive plant. Its use is to facilitate visionary states of consciousness during spiritual healing sessions. Nootropics, also commonly referred to as “smart drugs”, are drugs that are claimed to improve human cognitive abilities. Nootropics are used to improve memory, concentration, thought, mood, learning, and many other things. Some nootropics are now beginning to be used to treat certain diseases such as attention-deficit hyperactivity disorder, Parkinson’s disease, and Alzheimer’s disease. They are also commonly used to regain brain function lost during aging. Other drugs known as designer drugs are produced. An early example of what today would be labelled a ‘designer drug’ was LSD, which was synthesised from ergot. Other examples include analogs of performance-enhancing drugs such as designer steroids taken to improve physical capabilities and these are sometimes used (legally or not) for this purpose, often by professional athletes. Other designer drugs mimic the effects of psychoactive drugs. Since the late 1990s there has been the identification of many of these synthesised drugs. In Japan and the United Kingdom this has spurred the addition of many designer drugs into a newer class of controlled substances known as a temporary class drug. Some national laws prohibit the use of different recreational drugs; and medicinal drugs that have the potential for recreational use are often heavily regulated. However, there are many recreational drugs that are legal in many jurisdictions and widely culturally accepted. Cannabis is the most commonly consumed controlled recreational drug in the world (as of 2012). Its use in many countries is illegal but is legally used in several countries usually with the proviso that it can only be used for personal use. It can be used in the leaf form of marijuana (grass), or in the resin form of hashish. 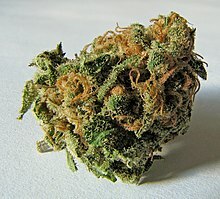 Marijuana is a more mild form of cannabis than hashish. ^ Richard Lovett (24 September 2005). “Coffee: The demon drink?”. Archived from the original on 11 April 2014. Retrieved 2014-05-01. ^ a b “Drug”. Dictionary.com Unabridged. v 1.1. Random House. 20 September 2007. Archived from the original on 14 September 2007 – via Dictionary.com. ^ “Drug Definition”. Stedman’s Medical Dictionary. Archived from the original on 2014-05-02. Retrieved 2014-05-01 – via Drugs.com. ^ Atanasov AG, Waltenberger B, Pferschy-Wenzig EM, Linder T, Wawrosch C, Uhrin P, Temml V, Wang L, Schwaiger S, Heiss EH, Rollinger JM, Schuster D, Breuss JM, Bochkov V, Mihovilovic MD, Kopp B, Bauer R, Dirsch VM, Stuppner H (December 2015). “Discovery and resupply of pharmacologically active plant-derived natural products: A review”. Biotechnol Adv. 33 (8): 1582–614. doi:10.1016/j.biotechadv.2015.08.001. PMC 4748402. PMID 26281720. ^ “Drug”. The American Heritage Science Dictionary. Houghton Mifflin Company. Archived from the original on 14 September 2007. Retrieved 20 September 2007 – via dictionary.com. ^ a b Mahoney A, Evans J (6 November 2008). “Comparing drug classification systems”. AMIA Annual Symposium Proceedings: 1039. PMID 18999016. ^ a b Bergström, CA; Andersson, SB; Fagerberg, JH; Ragnarsson, G; Lindahl, A (16 June 2014). “Is the full potential of the biopharmaceutics classification system reached?”. European Journal of Pharmaceutical Sciences. 57: 224–31. doi:10.1016/j.ejps.2013.09.010. PMID 24075971. ^ Crocq MA (June 2003). “Alcohol, nicotine, caffeine, and mental disorders”. Dialogues Clin. Neurosci. 5 (2): 175–185. PMC 3181622. PMID 22033899. ^ “Recreational Drug”. The Free Dictionary. Retrieved 16 March 2015. ^ Fox, Thomas Peter; Oliver, Govind; Ellis, Sophie Marie (2013). “The Destructive Capacity of Drug Abuse: An Overview Exploring the Harmful Potential of Drug Abuse Both to the Individual and to Society”. ISRN Addiction. 2013: 450348. doi:10.1155/2013/450348. PMC 4392977. PMID 25938116. Archived from the original on 11 September 2015. Retrieved 15 April 2015. ^ Harper, Douglas. “drug”. Online Etymology Dictionary. ^ Tupper KW (2012). “Psychoactive substances and the English language: “Drugs,” discourses, and public policy”. Contemporary Drug Problems. 39 (3): 461–492. doi:10.1177/009145091203900306. ^ “About Registration: Medicines and Prescribing”. Health and Care Professions Council. Archived from the original on 2016-01-13. Retrieved 22 January 2016. ^ “Glossary of MHRA terms – P”. U.K. Medicines and Healthcare products Regulatory Agency. Archived from the original on 2008-11-14. Retrieved 2008-11-05. ^ ““Generic Drugs”, Center for Drug Evaluation and Research, U.S. Food and Drug Administration” (PDF). Fda.gov. Archived (PDF) from the original on 29 August 2017. Retrieved 11 October 2017. ^ Sobiecki, Jean-Francois (July 2012). “Psychoactive Spiritual Medicines and Healing Dynamics in the Initiation Process of Southern Bantu Diviners”. Journal of Psychoactive Drugs. 44 (3): 216–223. doi:10.1080/02791072.2012.703101. PMID 23061321. 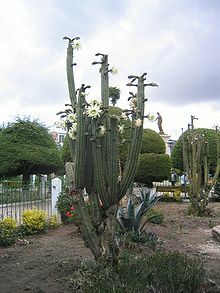 ^ “A Brief History of the San Pedro Cactus”. Mescaline.com. Archived from the original on 28 September 2016. Retrieved 11 October 2017. ^ Terry M (2013). “Lophophora williamsii”. IUCN Red List of Threatened Species. doi:10.2305/IUCN.UK.2013-1.RLTS.T151962A581420.en. Archived from the original on 2015-05-24. ^ “Brazilian Archives of Biology and Technology – Jurema-Preta (Mimosa tenuiflora [Willd.] Poir. ): a review of its traditional use, phytochemistry and pharmacology”. scielo.br. Archived from the original on 2009-03-07. Retrieved 2009-01-14. ^ Teale P, Scarth J, Hudson S (2012). “Impact of the emergence of designer drugs upon sports doping testing”. Bioanalysis. 4 (1): 71–88. doi:10.4155/bio.11.291. PMID 22191595. ^ “World Drug Report 2012” (PDF). UNODC. 2012. p. 69. Archived (PDF) from the original on 13 July 2012. Retrieved 9 December 2016. ^ Al-Mugahed, Leen (2008). “Khat Chewing in Yemen: Turning over a New Leaf: Khat Chewing Is on the Rise in Yemen, Raising Concerns about the Health and Social Consequences”. Bulletin of the World Health Organization. 86 (10): 741–2. doi:10.2471/BLT.08.011008. PMC 2649518. PMID 18949206. Archived from the original on 10 March 2016. Retrieved 22 January 2016. ^ “The administration of medicines”. Nursing Times. EMAP Publishing Limited. 19 November 2007. Archived from the original on 17 June 2010. Retrieved 11 January 2016. ^ “Animal Food & Feeds”. Fda.gov. Archived from the original on 22 March 2015. Retrieved 14 March 2015.